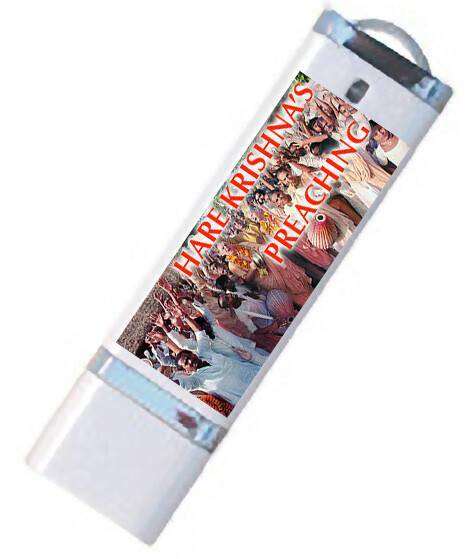 A huge collection of inspiring preaching programs and videos on a USB thumb drive. Includes Festivals, Science, Evolution, Reincarnation, Vegetarianism, Children's Krishna Shows and more. About 36 hours of video programs. Many shows on the Polish Woodstock festival including: 'Festival of India Baltic Coast Tour', 'Krishna's Village of Peace', 'Poland's Summer Festivals', 'Polish Woodstock Festival'. And many shows on the 1986 ISKCON Padayatra including: 'A Day on Padayatra', 'Every Town and Village', 'Lokanatha Swami on Padayatra', 'Padayatra India', 'Padayatra Worldwide', 'Padayatra New Zealand', 'Padayatra Australia'. Plus Prahupada Biography: 'Your Ever Well-Wisher' and Childrens Krishna shows including Animated Ramayana, Krishna Puppet Shows, etc. Includes: 'Coming Back -- Reincarnation in America', 'Death and Dying in Vedic India', 'Reincarnation - Peter Ramsy - Australian Television', 'The Spark of Life'. Includes: 'The Hidden History of the Human Race', 'Mysterious Origins of Man', 'Mysteries of the Sacred Universe', 'Scientific Verification of Vedic Knowledge', 'Vedic Cosmos'. Shows include: 'Bullock Man' - Australian Televison show with Olivia Newton-John, 'India's Holy Cow Becoming Extinct', 'The Sacred Cow', 'Save our Cows, Save our Villages', 'Save the World, One Cow at a Time'.